Korean skincare and beauty products seem to be a fad these days. 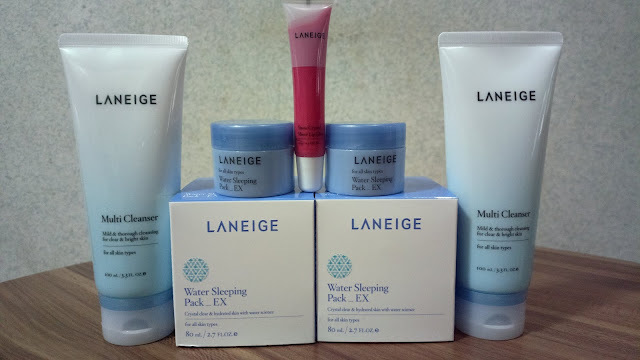 But I didn't buy the Laneige Multi Cleanser and Water Sleeping Pack from OShopping because it's a trend. I just wanted to try how shopping at OShopping works. So far, it was great as I've talked about in this post, Online Shopping Experience with OShopping. Going back to the package, it is quite affordable considering the fact that it contains twice for each product; the multi-cleanser and the sleeping pack in large containers and travel sizes. A lip gloss is also included along with a free sun spray. We tried the latter during last summer's El Nido, Palawan trip. However, it was a disaster and I felt embarrassed for even offering it to the group because it didn't work at all. They all got sun burned during the day we used it and were happier the previous day with a used up bottle of a local sun screen lotion brand. Oh well, can't expect much from something free. The multi-cleanser works well for exfoliation and thorough cleansing but it's not recommended for those with sensitive skin. The water sleeping pack is supposedly used just once or twice a week but it's quite OK to use for more than that. After washing it off in the morning, I can feel my skin moisturized. With constant use, I noticed and felt tighter pores as well. Other than these, I see no other significant effects. For those with darker skin tone, you are supposed to notice a visibly lighter skin too although I didn't see this happening. In case you're interested to buy the product, it's available through the OShopping network, see Laneige White Plus Renew Original Essence Set. The set now comes with more products.